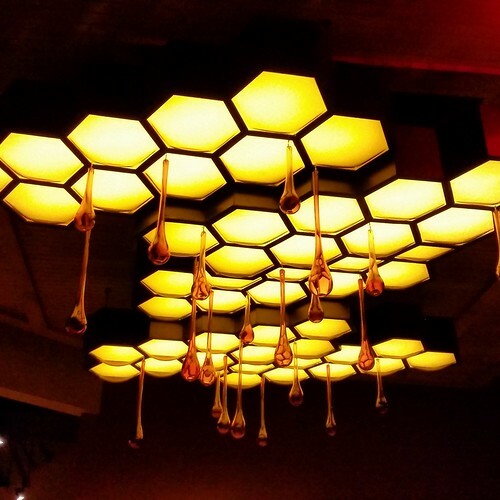 Picture of the Week: Tupelo Honey Cafe’ in Raleigh! I snapped this week’s picture while checking out the new Tupelo Honey Cafe‘ in Raleigh’s Cameron Village. Pictured above is a wonderful honeycomb light fixture made of steel and blown glass created by local designers at McConnell Studios. It really catches your eye as you enter and is sure to be one of the most photographed features of the restaurant! Tupelo held a soft opening this past weekend but will be open to the public starting Monday December 1st. The restaurant is located at 425 Oberlin Road and features scratch-made Southern comfort foods with everything from fried chicken to shrimp and grits to organic burgers and buttermilk biscuits. They also make outstanding desserts and have a great bar serving signature craft cocktails and a nice selection of craft beers. I’ll be doing a full write up about Tupelo in the next week or so, but in the meantime I wanted to pass along the news that Tupelo is now open! You can read more about Tupelo Honey Cafe and check out their menu here. Oh man! I was JUST wondering when this would be open! Thank you for posting! Any clue when the grand opening will be? So excited to go here! I’ve loved this place in Asheville, and I’m so happy to have it here at home! And that fixture is awesome!